What do I do first: "Determine the Size of the Kit"
5) To help you with your project there are two links on the left; a blank worksheet and a worksheet example to help you configure your kit weights and sizes. Q) How do I determine the weight capacity? A) Once you know the weight of equipment, people and other items to be carried on your boat open the weight capacity link on the left and find a boat kit size with a corresponding weight greater than the weight required for your equipment. The capacity should be 15% more than you need. If you need help just call or email U-Fab Boats. Please view the chart on left under Info Links. Q) I have selected the size now what is the cost? 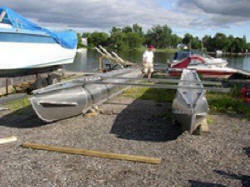 A) Due to so many price combinations you must call U-Fab Boats or send an email for pricing. Q) I know the size and price, how do I order it and get it to my location? 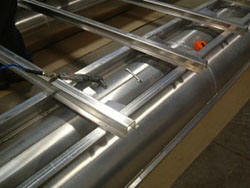 A) Get in touch with U-Fab Boats and place your order. A deposit of 50% is required before production. 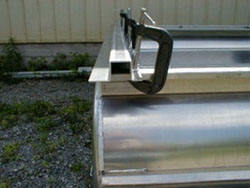 Shipping is done in some areas by our own trucks or with a common carrier. Q) I have the kit at my location, how do you assemble it? Tools Required: Power Hand Drill & drills (1/8",3/16",5/16", 3/8", & 5/32"), Drill Drive Bits (for flooring screws), Ratchet Wrench (with 1/4" & 3/8" attachments and same size spanners), Pop Rivet Gun, 25' Measuring Tape, 50 ft. of string, pencil or fine point marker. 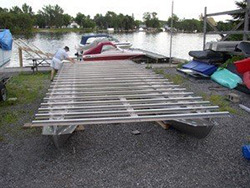 1.Place the 2 pontoons on the ground, making sure they are parallel and the proper distance apart. 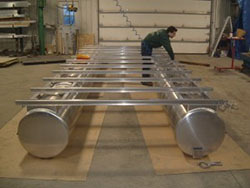 Place a cross member at the rear and front of kit and install. 3.Allign and center motor support and install. 5.Cut out area for motor to tilt. 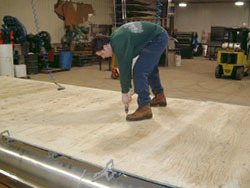 6.Install carpet or other flooring if required. 9.Install options such as railing and seats. 10.Take to the water, your done.